Perla Campos, a four-year veteran of Carnival Cruise Lines’ employee services department, has been named the company’s Volunteer of the Year. Campos was recognized for her efforts in helping the South Florida community, particularly for her role a project leader for the company’s ongoing support of the Bay Oaks Home for the Elderly in Miami. The award was presented at Carnival’s 16th annual volunteer reception which acknowledges the community service efforts of the company’s employees who each year collectively donate 4,000 volunteer hours on 100 service projects throughout Miami-Dade and Broward Counties. 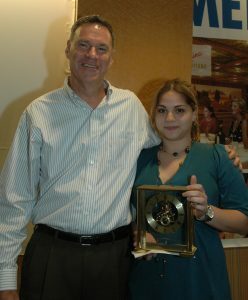 Campos (right) is pictured here at the reception with Carnival President and CEO Gerry Cahill. In conjunction with the award, Carnival donated $1,000 in Campos’ name to the charity of her choice. Carnival’s community service efforts are coordinated through its “Friends Uniting Neighbors (F.U.N.) Team,” an employee-directed volunteer group that was formed in 1997 and works with a wide range of local charitable and social service agencies and organizations throughout South Florida.